Dorothea Kropp was born in Nebraska City, Nebraska on August 10, 1911. In 1934, she graduated from the University of Nebraska in Lincoln where she was a member of Alpha Omicron Pi. Later, she attended graduate school in Paris, France. During World War II, she volunteered with the Women Accepted for Volunteer Emergency Service (WAVES) where she worked as a supply clerk at the Naval Air Station Olathe in Gardner, Kansas. After the war, she returned to her art studies and became one of the top interior decorators for Gold’s, a department store located in downtown Lincoln. As an artist, Kropp enjoyed painting with oils to create vivid landscapes of areas that she knew and loved. 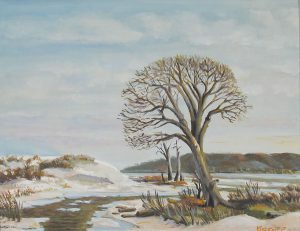 Some of her favorite subjects were mountain scenes and areas around the Platte River in Nebraska. She was an active contributor and member of the Lincoln Artists’ Guild during her later years. Today, the Dorothea A. Kropp Memorial Scholarship offers an art scholarship to Nebraska City High School students wishing to pursue further art education. She died on October 5, 1976 in Lincoln, Nebraska. The Museum of Nebraska Art has one work by Dorothea Kropp.